The Dog Woofer is a seemingly new concept in the field of sound systems. Except for a few sound emitting technologies, this new woofer is very different from other woofers currently available on the market. 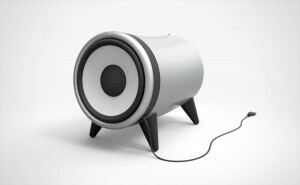 Designed by Esben Oxholm Bonde, famous for his extraordinary and unique designs, this new Dog Woofer does not follow the traditional woofer designs and in fact has been designed in such a way that you don’t have to hide it in some unnoticeable corner of your room. The Dog Woofer is shaped in an untraditional way in order to make it a very good-looking device that can add an extra humor to your room. Its front part consists of a 10-inch woofer which can bring a great amount of additional bass to your home stereo. The back part consists of a special bass reflex port along with an interface system for allowing you to control the sound. Besides the ‘on’ and ‘off’ buttons, this new woofer also flaunts potentiometers to help you control the level, phase and the crossover frequency. Moreover, you can also set the sound and the amount of bass as per your requirements, taste and likings. Aside from being a good-looking and stylish device, the Dog Woofer functions wirelessly as well. It further implies that you don’t need those odd cables running through half of your walls and all over the house in order to connect your woofers. Its unique design is sure to attract enough takers who would love to have it in their house. After all, it would add a touch of chicness to their living room or any other area of their house. If we go by the features and specifications of Dog Woofer, we have no reason to label it a figment of imagination. Rather, we may see it hitting production lines sooner than you think.